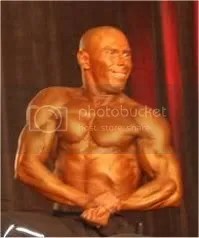 Over all (Pro and Amateur) CAREER PLACINGS 50%, if I entered a show, I placed 1st in my class. ONLY: 1 out of the 16 shows didn’t place in top 3. That was my messing up with my peek week. $1000.00 for 1st ————- I took 1st. Amateur Shows and Stats (basically for sponsors). There was another INBF show in the early 2000’s in there, I totally blew coming in and didn’t place. 11 Shows, Placings in class: 3 = 1st’s , 4 = 2nd’s, 3= 3rd’s. CAREER Amateur PLACINGS 46.66%, if I entered a show, I place 1st in my class. ONLY: 1 out of the 15 shows didn’t place in top 3. Abb Machine (we found a setting that don’t hurt my back). I love the fact we found a way to hit my Abb’s better. Post cutting power is coming back a little. Dedication to nutrition a little off with taste buds still going crazy. Getting a rain on it and keeping to a reverse diet plan. May have did a little high card jump this week but I can adjust to it. Machine Preacher Curls = All Negatives with a goal of a 30 count. Tri Extension Machine = All Negatives with a 30 count goal. 10 min’s hand bike at wake up. 3 Sets Chest Supported “T” Bat Rows. 4 Sets Seated Incline Bench Face up Db Shrugs. 2 Sets Pro Grip Lat Pulldowns Elbows forward, to front of chest. 3 Sets Straight Arm Pull Downs. Packed gym but got 25 Sets and 20 min’s cardio in, and in 70 min’s. 4 Sets “Glass Style” Db Side Delt Raises. 2 Sets H.S. ISO Shoulder Presses. 20 min’s Hand Bike cardio. B/W = 136.8 this morning. 30 min’s hand bike cardio this morning. Posing threw out the night. A total of 1.5 hours at the least. Tomorrow will be a re-feed and Chest day. 15 sec breaks between sets, 30 sec break between exercises. * 4-4-4-1 tempo and drop sets from here down. Last Back Power day before show day. 15 sec brakes (only long enough for Tammy to add or subtract plates) 23 sets. *both arm pulls, squeeze and hold on contraction. * both arm pulls, squeeze and hold on contraction. 1 hour of posing tonight at the least. 1 set Reverse Grip Tri Press Downs. Posing 1 hour. Look at nutrition plan for peek week. 19 days out from the Natural Nationals. I didn’t plan on starting a raise in carbs but with the way weight is dropping and even with a carb raise it will. I started a raise now. OK now on to todays W/O. Today again a 4-2-4-1 tempo. Rest-pause threw the whole workout. 24 sets. Being a rest-pause I used lighter weights so I could hit 10 reps at the least. Today was a rep range and squeeze 4-1-4-0 tempo work outs. 3 Sets Pro Grip Lat Pull Downs to back of neck. 3 Sets of Single Arm Preachier Machine Curls for saturation. 4 Sets weighted Abb Crunches. Off everything today. Re-feed, show day prep testing, posing on and off all day. See “Thoughts Today” later today, see my thoughts on todays testing. Did chest today. Held off on cardio. 20 Sets today for “A” workout. 4 Sets of Decline Bb Presses. And 30 min’s of posing.